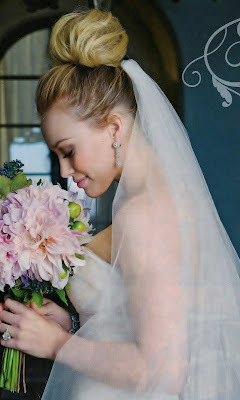 bostonstylista by Sarah McManus: Hilary Duff's Glamorous Wedding Hair Do Tips! Hilary Duff's Glamorous Wedding Hair Do Tips! Hilary Duff was married last week to hockey player Mike Comrie. I fell in love with not only the Vera Wang gown but her hair. It was so glamorous and chic. Many women are afraid to take chances on their big day and Duff went right for this unexpected choice. Hilary definitely likes to flirt with fashion and always adds a spin to her look. It fit perfectly. If you want to recreate Duff's do, here are a few tips from renowned Nicholas Penna, Jr. of SalonCapri in Newton & Dedham, MA. SalonCapri is one of only 12 salons in the country to house the L’Oréal Professionnel Haircolor Center on site. Nick regularly styles hair for photo shoots and major events like NYC Fashion Week. Nick calls this look "a modern, elegant take on the oh-so-classic high, wedding bun. This look is classic with an edge." 1.) Nick suggests that before attempting this updo, you should research accessories or false hair pieces to achieve this look. He recommends a clip-in hair extension or hair weft. 2.) Once you have your accessories in hand, give yourself a full blow-dry using a volumizing product such as Kerastase Vol-Active Mousse. Apply this product to damp hair before blow-drying. 3.) Starting at the roots and from the front of the hair, begin to tease the hair up. The goal is make the hair and full as possible! 4.) Pull the remainder of the hair into a ponytail, but make sure that you do not smooth the front part out as you do so. You want it to be left messy! 5.) Secure the hair into a ponytail at the top of your head (think crown of your head). 6.) Place the weft at base of ponytail, wrapping the hair up and around it to create the large bun. 7.) Strategically pin down the hair, around the shape of the bun. Nick recommends using bobby pins that match the color of your hair so that they blend. 8.) Finish the look with a strong hold hair spray. Nick suggests L’Oreal Professionnel Texture Expert Infinium 4 Extreme Hold Finish. Inspired by Hilary, I began noticing more and more the chignon I adore on the runways. I have been a fan since I was a child. My Italian Nona always wore her blonde "chignon" as she called it and it reminds me of extreme GLAM. Anyone can wear it! It can be casual as well. Nick gives us some more tips on how to achieve this look. 1.) Give yourself a full blow-dry using a volumizing product such as Kerastase Vol-Active Mousse. Apply this product to damp hair before blow-drying. 2.) Starting at the roots and from the front of the hair, begin to tease the hair up. The goal is make the hair and full as possible! 3.) Pull the remainder of the hair into a ponytail, but make sure that you do not smooth the front part out as you do so. You want it to be left messy! 4.) Secure the hair into a ponytail at the top of your head (think crown of your head). 5.) Tease the ponytail, section by section – tease everything, says Nick! 6.) One by one, wrap the sections around the elastic, creating the shape of the bun. 7.) Secure the bun with bobby pins. Nick recommends using bobby pins that match the color of your hair so that they blend. Pinkberry is Coming to Boston! Camera, Lights, Action! Oh My!